Each captain can get a crafting level from 1 to 50 and gain XP for crafting materials and ships. Some blueprints get available if you reach a certain crafting level, others well be rewarded randomly when crafting/breaking up ships. To start crafting you need to be in any port with an outpost in it. Building ships/materials will cost labor hours and each day you will get a certain number of labour hours which can be stored to a limit. You can store more labour hours if you have a higher crafting level. You will also need different materials for building, to get a full list of materials needed to build and a proposed build order for a ship, take a look at Ship Crafting Helper. The current maximum labour hours available is (Craft Level * 20) + 1000. Per real life hour you will generate 42 labour hours. 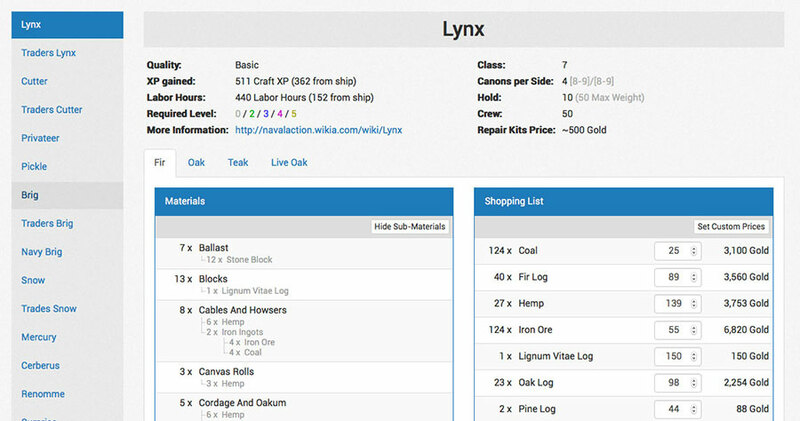 The Ship Craft Helper helps you to organize your shopping and crafting ships and modules for Naval Action.